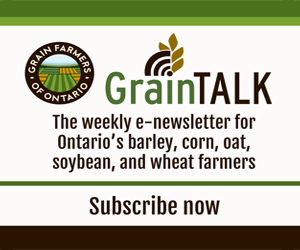 on-farm storage and grain drying systems are trending in Ontario right now. Fueled by corn, the construction of storage and grain dryers has increased over the past five years and is expected to continue growing, according to Lisa Devolder, business manager for Devolder Farms in Chatham-Kent, Ontario. The family-owned business started as a cash crop farm and seed production plant and has been in the grain equipment business since 2005. “The same factors leading to the construction of on-farm storage also affect grain drying systems,” says Devolder. She notes yield increases and innovations in crops, more grain marketing options, land transfers and updated systems as key reasons growers are expanding their facilities. These investments can lead to real cost savings when compared to elevator storage and drying fees. And in some parts of the province where commercial elevators are closing down, the construction of on-farm storage and drying systems is much more appealing than dealing with the headache of arranging trucking and storage. Not only does the expansion into grain dryers and on-farm storage make sense for an increasing number of Ontario growers, but the right system can also go a long way in increasing the quality and marketability of their grain. As a rule, lowering the moisture content of grain increases its quality and marketability. While corn is typically harvested at 32 percent moisture or lower, most buyers require a moisture content of 15.5 percent. Drying, or exhausting water from the grain, can also reduce grain quality if the grain gets too dry. This causes the moisture content to fall below the desired percentage and reduces the weight per bushel, and to a grower, a lower weight means lost money. Finding the right drying system is important for grain quality, farm management and maintaining a healthy bottom line. Chad Prangley, sales representative for Devolder Farms, outlines the pros and cons of different on-farm drying systems (in-bin, continuous flow and commercial) and what to keep in mind for those in the market for updating or constructing a grain drying system on their farm. With three in-bin dryer options – stir bin, roof type and continuous – grain is dried in batches up to a capacity of 10,000 bu per 24 hour period. They also offer grain storage and are great for growers looking to make investments in their farm operations on a smaller scale. Grain comes out cool from both the stir bin and roof type in-bin dryers, while the continuous in-bin dryer discharges hot grain. Also known as portable dryers, these dryer systems can be towed from farm to farm, though they seldom are in Ontario due to electrical and natural gas hook-ups. Continuous flow dryers offer a higher bushel capacity than in-bin dryers of up to 25,000 bu per 24 hour period, but don’t provide storage. The continuous flow system fills up from the top and empties dried grain out the bottom of the dryer with the option of discharging hot or cool grain. The largest dryer system, commercial dryers are also referred to as tower dryers for their shape and height. Commercial dryers have the capacity to dry 6,000 to 7,000 bu per hour, or more than 100,000 bu per 24 hour period and grain comes out cool. Deciding which dryer system is the best fit for an operation can be difficult for growers. Prangley says a grower’s total acreage and projected yield of corn is the most important factor in determining the ideal on-farm drying system. “Corn acres drive all the decisions,” explains Prangley since it’s the crop that typically needs to be dried each year. Length of drying time should also be considered and he recommends all crops should be dried within a four to six week window, otherwise growers could find themselves battling snow and ice late in the harvest season. Storage also needs to be considered and in-bin dryers are an attractive option for those who need both dryers and storage. New or additional storage is necessary if growers choose continuous flow or commercial dryers since they don’t offer storage. And additional equipment such as augers, blower systems and wet storage bins are additional considerations when constructing storage. A grower’s age and long term plans are also factors in determining the right dryer system. “We advise those starting out or planning to expand to not only think about what they need today, but also how future expansions, or an increase in yield and acres will affect the layout of drying and storage systems,” says Prangley. The resale value of a dryer system should be a factor for those growers close to retiring or without long-term plans for the farming operation. While any dryer or storage system is an investment, the design of continuous flow dryers not only makes them easy to construct, but easy to dismantle, sell, or move to another location. Some dryer systems are more labour intensive than others, bringing the skill and availability of labour into the purchasing consideration. Prangley explains that in-bin, or batch drying systems need more attention and labour because they constantly need to be filled and emptied. In-bin dryers also need more attention to monitor the moisture content when compared to the automated features offered with continuous flow and commercial dryers. The last thing to consider when selecting an on-farm grain drying system is whether the grower wants the grain to come out hot or cool from the dryer. Cool grain can be shipped or stored immediately, making it an attractive option in dryer systems. Hot grain requires additional storage bins since it will not cool if immediately stored in a large bin, and if left uncooled, the continued heat could affect grain quality. On-farm storage and grain drying systems will offer growers more marketing options, while continuing to deliver high quality grains to a variety of markets and end users. It’s important that growers choose the best option for their operation; for some it may be delivering to a local elevator, and for others, the construction of a well-planned on-farm system. What kind of system fits on my farm? Chad Prangley, Devolder Farms sales representative, says the size and capacity of on-farm drying systems should be based on a grower’s current corn acres. Where should I put my system? Helmut Spieser, OMAFRA engineer, advises growers to consider the following points when planning the construction of on-farm grain drying and storage systems.